Most optical disc drives require you to press a button on the front of the drive to open it. This button can be hard to find or get to on some machines. However, you can use a keyboard shortcut to open your optical drive. Download Door Control (scroll down a bit on the page), double-click the .exe file, and follow the on-screen instructions to install the program. When you get to the last screen on the setup wizard, click the “Launch Door Control” check box so there is a check mark in the box and click “Finish”. Door Control runs and an eject icon is added to the system tray. When you move your mouse over the icon, a tooltip displays showing you which drive is currently selected and that no Shortcut Key has been defined yet. If you have multiple optical drives, you can select which drive you want to be able to open using Door Control. 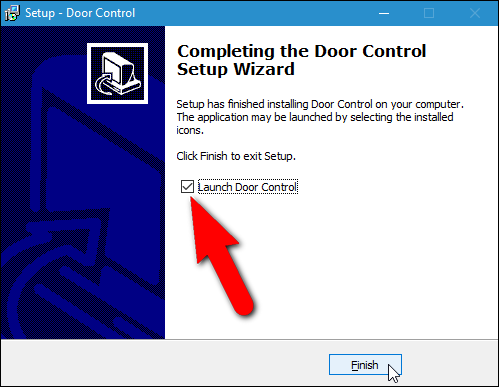 Right-click on the Door Control eject icon in the system tray, select the “Drive” option at the top of the popup menu, and then select the drive you want to open using Door Control from the submenu. NOTE: If you’ve mounted an ISO file, the letter for that drive displays in the submenu. You can “eject” a mounted ISO file, but note that if you used Virtual CloneDrive to mount it as discussed in the linked article, the ISO file may mount itself again. That’s what happened to me when I tested this. An ISO file mounted using Virtual CloneDrive (which you really only need if you’re using Windows 7) must be unmounted using Virtual CloneDrive. If you only have one optical drive and have no ISO files mounted, the “Drive” option is not available on the menu. If you add an external drive or mount an ISO file while Door Control is running, and you want it accessible in Door Control, you must exit the program and run it again. 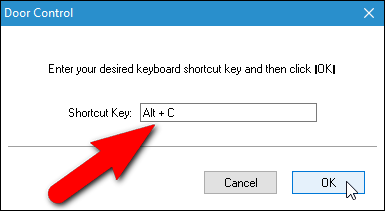 To assign a keyboard shortcut you can use to open your optical drive, access the popup menu again and select “Hot Key”. Make sure the cursor is in the “Shortcut Key” edit box, which initially should read “None”. Press the keyboard shortcut you want to use to enter it into the edit box, and then click “OK”. Now, when you move your mouse over the eject icon in the system tray, the shortcut key you assigned displays. If you want Door Control to start automatically every time Windows starts, select “Load Door Control at Startup” from the popup menu. When the option is on, a check mark displays next to it, as shown below. You can also change the color of the button and the eject symbol on the button. To do this, right-click on the Door Control icon and select “Set button colors” from the popup menu. 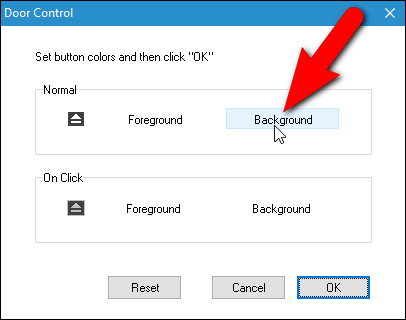 Colors can be selected for the “Foreground” (the eject symbol) and the “Background” on the button in its “Normal” state and “On Click”. Click “Reset” to reset the colors to the default. 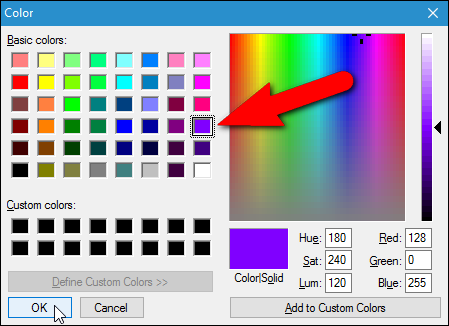 Click on a color in the “Basic colors” section or click on a box under “Custom colors” to create your own color using the color selector on the right or the edit boxes to define a specific color. Click “OK” once you’ve chosen your color. The button in the system tray dons the newly selected colors. Door Control claims to be able to also close the optical drive, but that feature depends on the hardware. It probably won’t work on most laptops, but may work on desktop PCs, where pressing the button a second time closes the door. I tested Door Control on both my desktop PC and laptop and it opened and closed the optical drive on the desktop PC, but only opened the drive on the laptop.